As many as 74 schoolgirls in Afghanistan’s far north fell sick after smelling gas and were being examined for possible poisoning, local officials said on Sunday. While instances of poisoning are sometimes later found to be false alarms, there have been numerous substantiated cases of mass poisonings of schoolgirls by elements of Afghanistan’s ultra-conservative society that are opposed to female education. Local officials said the girls became ill after smelling gas at their school, Bibi Maryam, in Takhar province’s capital, Taluqan. The city is about 250 kilometers north of the country’s capital, Kabul. The Takhar governor’s spokesman, Sulaiman Moradi, blamed” enemies of the government and the country” for the mass illness and said the aim was to stop girls from going to school. The girls were taken to the provincial hospital and most were released after being treated, though several remained in a critical condition on Sunday evening, the head of the hospital, Dr. Jamil Frotan, said. The apparent poisoning came three days after more than a dozen students fell ill in another girls’ high school in Taluqan. No-one has claimed responsibility for either incident. 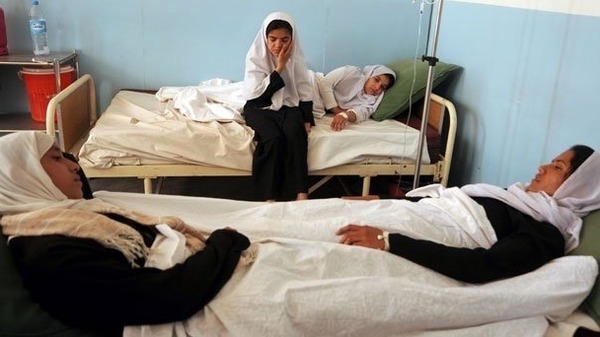 Between May and June last year there were four poisoning attacks on a girls’ school in Takhar, prompting local officials to order principals to stay in school until late and staff to search the grounds for suspicious objects and to test the water for contaminants. Takhar has been a hotbed of militancy and criminal activity since 2009, with groups such as the Taliban and the Islamic Movement of Uzbekistan active. Since the 2001 ousting of the Taliban, which banned education for women and girls, females have returned to schools, especially in Kabul. But periodic attacks against female students, their teachers and their school buildings, continue. Afghan women have won back basic rights in education, voting and employment since 2001, but fears are growing that such gains could be traded away as Western forces prepare to leave and the Afghan government seeks peace talks with the Taliban.